The Paper Cut(e) design from Pepper & Joy is just that – cute! What could be more romantic than a pair of beautiful swans, gently bowing their heads together and effortlessly creating a heart shape? If you and your partner have a love of the outdoors, this wedding invitation could be just what you’re looking for! This special design is full of intricate details that you and your guests will be swooning over. Digitally printed on 148mm x 148mm 250gsm premium paper with a slight texture, it is obvious that the luxury of this invitation carries through from design to materials. Your names are printed in a scalloped-edged box, just above a few of your wedding day details. Just above this hangs a delightful length of bunting – a must for a summer, outdoor-themed wedding! The two elegant swans gently float upon a piece of ribbon, of which two thin branches sprout from to form a large, leafy heart which encompasses all of your above details. The invitation is teaming with sweet little leaves and flowers that flourish amongst one another, entwining and growing together – just like married life! 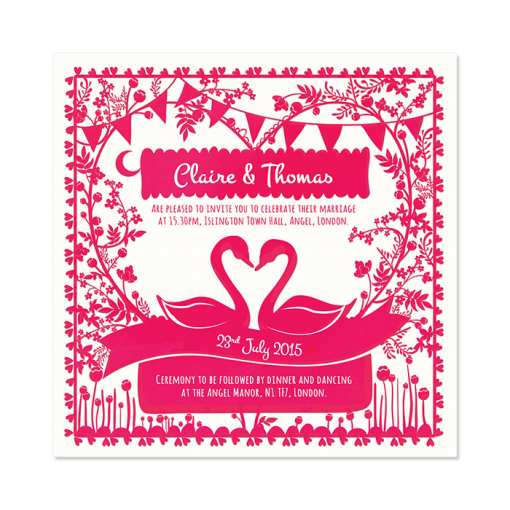 We particularly like the cute boarder that wraps around the whole of the invitation because it’s festooned with little love hearts, totally loved up and suitably romantic for your special day! The best bit is that you can personalise the wording and choose your own colour scheme to match the rest of your wedding colours, ensuring you have a truly seamless wedding package! Tags: Bunting, Pretty, Romantic, Shocking Pink, Swan.